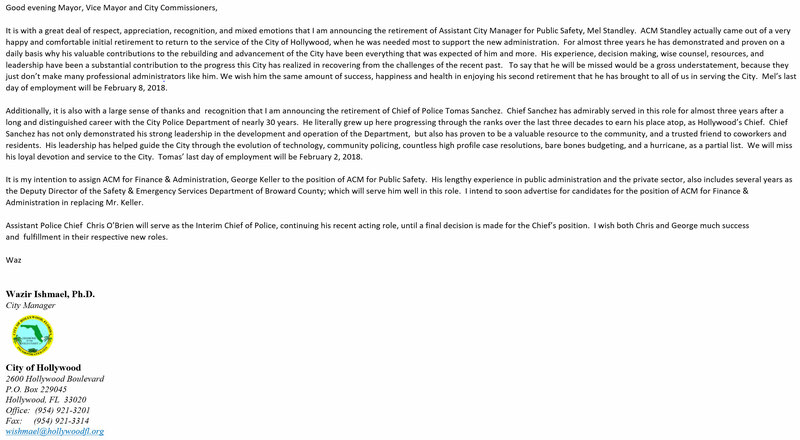 Attached is a copy of a letter drafted and disseminated by the CM last Thursday. It was sent to every POG and carpetbagger in the City; however, NO employees were sent the correspondence. The PBA thought you might want to know. Congratulations to Chief T. Sanchez for your 30 years of service and thanks to Coach Mel for your contributions over the past three years as the ACM/PSD. I’m sure you will miss the music in the FORD Explorer you inherited after BK/FTF/MB got his walking papers.